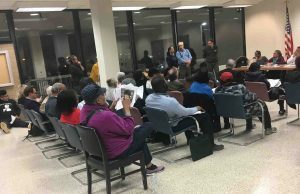 Ward 5C residents turned out in numbers to push back against Catholic Charities‘ proposal to build a solar panel farm in single-member district 5C01. Chairperson Manning acknowledged the standing room only crowd that showed up to voice their concerns. Catholic Charities responded in kind with several key presenters to attempt to address the communities’ concerns. However, by the end of the meeting, the audience wasn’t swayed. Catholic Charities is the social ministry outreach of the Archdiocese of Washington. 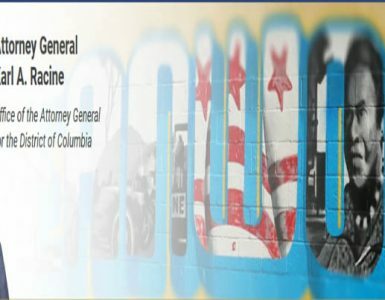 It operates 57 programs in 35 locations all in Washington, D.C. and the surrounding five Maryland counties. The Charities’ services include food assistance, legal and financial, employment, adult education, healthcare programs and emergency help among a number of other services. 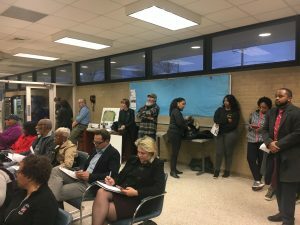 None of those services were on the agenda at Tuesday’s meeting. Catholic Charities is seeking special exception approval to build a solar panel array at 2800 Otis Street N.E. The goal of the array is to offset 100% of the electric cost across their facility. The project is being managed by Solar Energy Services. The anxious crowd respected Chairperson Manning’s request to allow Solar Energy Services to complete their presentation before launching in with a series of concerns. The residents were respectful yet firm as they voiced concerns in a number of areas. One of the very first complaints about the project was the sheer size of the effort. One resident alluded to the 5000-panel array as something more befitting an industrial area – not a residential area. Other concerns were related to the water management problems that already plague this area. 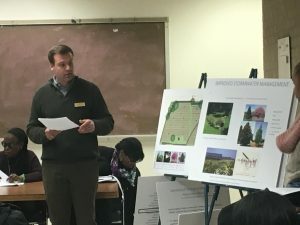 The concerns were not relieved by the presentation by Joshua Clark, Anacostia Watershed Society, showing how the extended roots of a proposed meadow would absorb more water than the current vegetation. 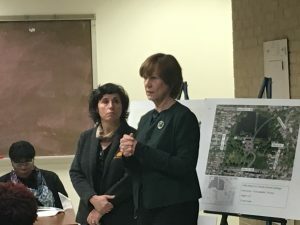 However, Lisa Walsh, Solar Energy Services bore the brunt of the discussion as she fielded questions regarding electromagnetic field (EMF) impacts, the noise generated by the solar panel inverters, the visual impact of the array on the neighborhood, and environmental study results. She also withstood a barrage of questions about how the array would negatively impact property values and how they would benefit from the array. She was later joined by Mary Jane Morrow, Catholic Charities’ Chief Financial Officer when the conversation moved towards land leases and the potential financial gain the organization will be receiving. 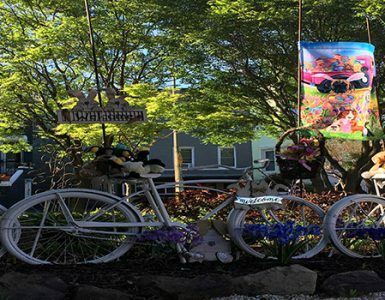 Residents charged the Charities with not being very good neighbors in the way they were handling this project and even bullying the neighborhood. To the Charities credit they took all questions and concerns with the same patience the residents exhibited earlier in the meeting. There are still a lot of issues that need to be resolved before this request can be moved to a vote by the Commission. Therefore, the Charities will return in April when the environmental study results are available. 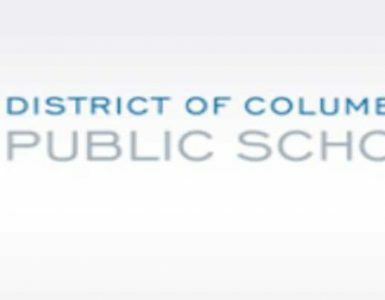 The DC Voice will continue to follow this issue moving to meet with the residents and Catholic Charities before that April meeting.